Bloggers and many other publishers have long ago discovered that to earn from their Adclicks and views of their posts and ads on their blogs, they need Adsense networks. Actually, it is the best source of income for most online publishers. I have been contacted by a lot of bloggers on this issue. What is challenging for most of them is to receive their payments. In this era of connectivity, that should not deter anyone. Their blogs or sites should be able to reach their full potentials of generating legit income for them. Google AdSense network has been faithfully handling that, providing the platform to reward you for the traffic to your site. Provided bloggers abide by the rules of the business, through the Adsense, payments are made promptly as at when due, which is about the end of every month. Adsense to effect the payout, you, the publisher have a lot of work to do on your site or blog and its contents so that it can generate substantial volume of traffic or views and adclicks such that it will meet the minimum threshold of payout for that month which can be pegged at $100. Thus if the minimum threshold is reached before 21st of the month, Adsense will make accessible to you what you have earned that month from Adclicks and views and this is via any of Wire Transfer, Check, EFT Transfers or Western Union. Simple as ABC? It should be as straight as that if most of the online publishers are able to access such funds accrued to them via those means. Being the only ones supported by the Google Adsense network, a task is up there for you. “That’s where the glitch lies,” you said? Relax! You’re not alone in it! This ordeal has propelled me into research and I have come out with something you’ll be proud you knew. I know most of us depend on Payoneer to access our earnings and facilitate the receipt of payments made for the services we render. If the global Payoneer, facilitator of international payments, has been providing a viable platform for settlement of bills for sole proprietors, big firms and small businesses worldwide, why can’t it extend the same services to Google AdSense. Unfortunately, Google Adsense does not pay to Payoneer account automatically. Yet, we see it every day as Payoneer is brokering payouts between clients and employees internationally easily. So I decide to explore the possibility of involving Payoneer in AdSense. For whoever finds this informative and fresh before I continue, signing up for or registering for a Payoneer account entitles you to a free US domiciled account. And your Payoneer card will be delivered to you in no distant time. In turn, this account enables you to receive your payment from any of your US individual clients or firms that employed you and your payments are in US dollars. Don’t forget, I didn’t list Payoneer with payment options of AdSense. But you can do the linking, yes I mean link Google AdSense with your Payoneer account. 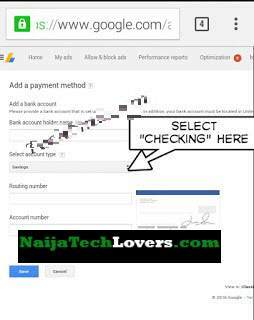 If you can successfully do the linking, you will start receiving your Google Adsense payments with your Payoneer account. Let’s come down a bit, How do you link them? Wait a minute! Is your AdSense account a US account? If no, I doubt it if you will not need to read other posts another session here for you to have your challenges surmounted. This is so because unless an AdSense account is US, it won’t support any Payoneer account. However if it’s a US AdSense account, you’re almost there. If not so, please quickly kick-start the process of signing up for a functional USA AdSense account. Select the option of “Receive Payments from US companies"
Copy the details of the account you will see which will include: Name of the bank account holder, type of the account—always checking, routing number, account number, and so on. Then log on to your US Google AdSense account, click on “Payment Setting.” From the next menu, select “banks.” A form will appear into which you will fill in the details gotten from your Payoneer account. In the field “Action Type” select “Checking”. To complete the process of linking the two accounts, Google will like to verify your Payoneer account. It will do this by sending a very insignificant amount there. I have found out affirmatively that it’s $0.38. This is never a largess, it is to ascertain the authenticity of the account and the person AdSense is dealing with. If there’s no further hitch, your Payoneer account should have been credited with the sum within 3 days. So be frequenting your account during the verification period. 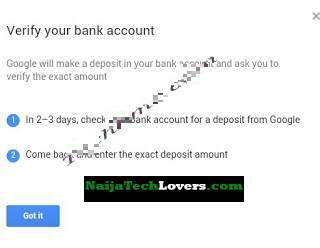 As soon as you are notified of the payment, log in once again to your Google AdSense account. Select the option “Verify payment”. Fill in the amount you just received and the particular of the payment and compete the action by clicking on “verify”. You surely have begun to enjoy what you yearn for. The next time your AdSense payment is due, say 21st of next month, be rest assured that your AdSense payments will be received with your Payoneer account. And when received, you can sell your payoneer dollars to us at a very good rate and get its naira equivalent credited into your account here in Nigeria instantly.